Associate Sales Representative is employed for selling the products and services of the company, the common work tasks for these representatives include attracting potential customers, communicating prospects face to face or through electronic media, advising clients, identifying the needs of the customers, presenting technical solutions, guide the customers and provide after-sales support. Candidates who are passionate about sales, self-driven, have strong communication, interpersonal skills, enjoy working with highly talented people can become an Associate Sales Representative. 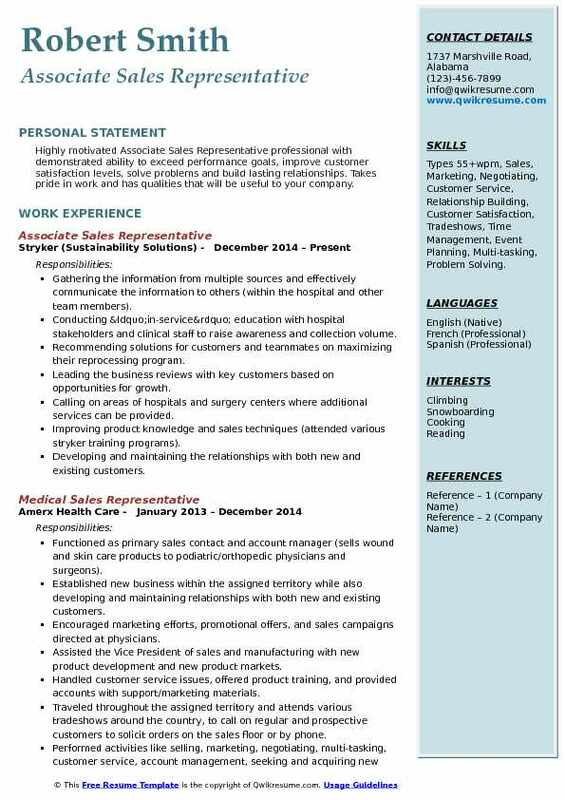 A resume that displays a bachelor’s degree in business, sales, communication, IT, finance, marketing or its related field have a better chance of getting picked for the post of associate sales representative. 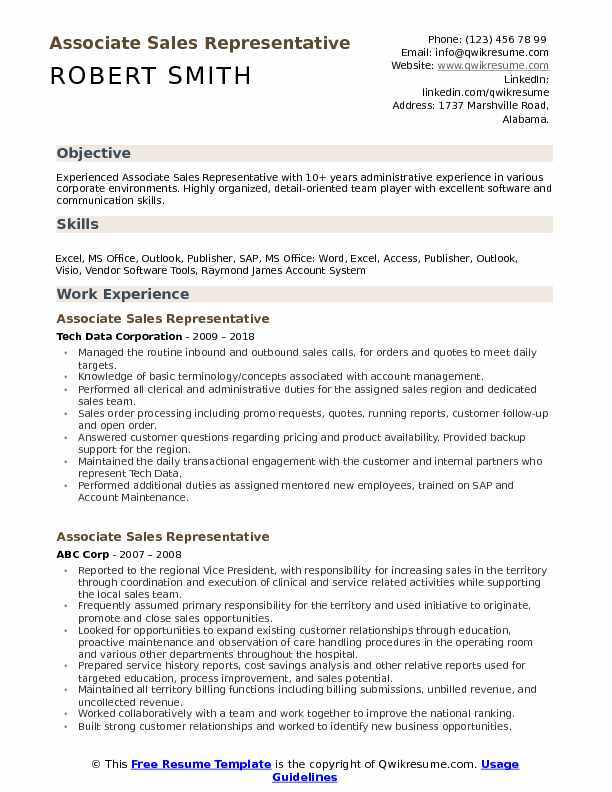 However, an Associate Sales Representative Resume sample that portrays a high school diploma with sufficient experience in sales is considered eligible for this job post. Summary : Experienced Associate Sales Representative with 10+ years administrative experience in various corporate environments. Highly organized, detail-oriented team player with excellent software and communication skills. Managed the routine inbound and outbound sales calls, for orders and quotes to meet daily targets. Knowledge of basic terminology/concepts associated with account management. 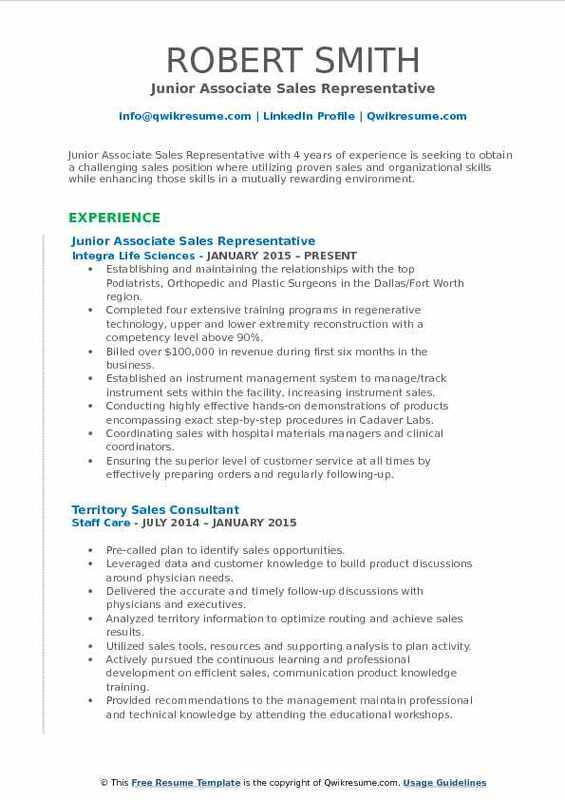 Performed all clerical and administrative duties for the assigned sales region and dedicated sales team. Sales order processing including promo requests, quotes, running reports, customer follow-up and open order. Answered customer questions regarding pricing and product availability. Provided backup support for the region. Maintained the daily transactional engagement with the customer and internal partners who represent Tech Data. Performed additional duties as assigned: mentored new employees, trained on SAP and Account Maintenance. Accomplishment: won the quarterly award for Top sales Support Rep. (three quarters). Doubled the business in one year from $75k per month to over $250k per month. 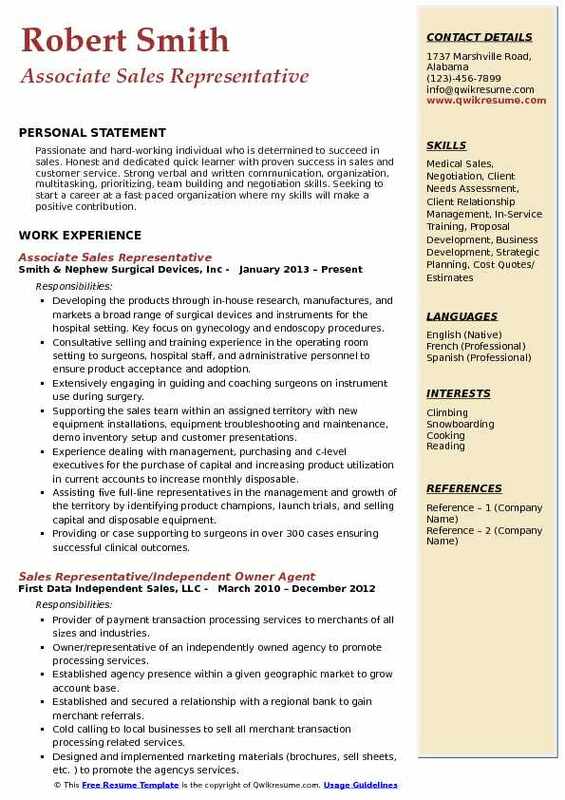 Summary : Senior Associate Sales Representative with 8 plus years of experience is seeking to continue to progress my career in medical sales with new and challenging assignments and opportunities that will allow me to learn, grow, and develop my abilities to provide value to my employer. 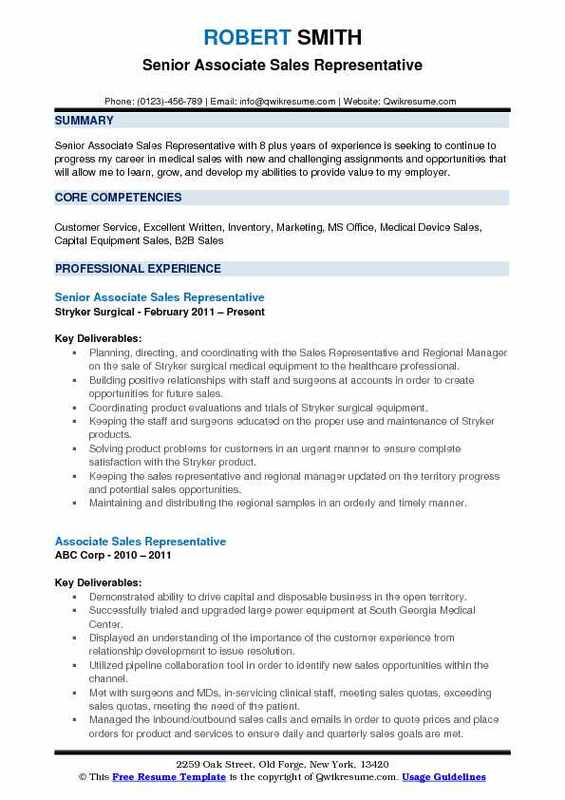 Planning, directing, and coordinating with the Sales Representative and Regional Manager on the sale of Stryker surgical medical equipment to the healthcare professional. Building positive relationships with staff and surgeons at accounts in order to create opportunities for future sales. Coordinating product evaluations and trials of Stryker surgical equipment. Keeping the staff and surgeons educated on the proper use and maintenance of Stryker products. Solving product problems for customers in an urgent manner to ensure complete satisfaction with the Stryker product. Keeping the sales representative and regional manager updated on the territory progress and potential sales opportunities. Maintaining and distributing the regional samples in an orderly and timely manner. Creating and harboring the important documents that are relevant and beneficial to the deep south region. 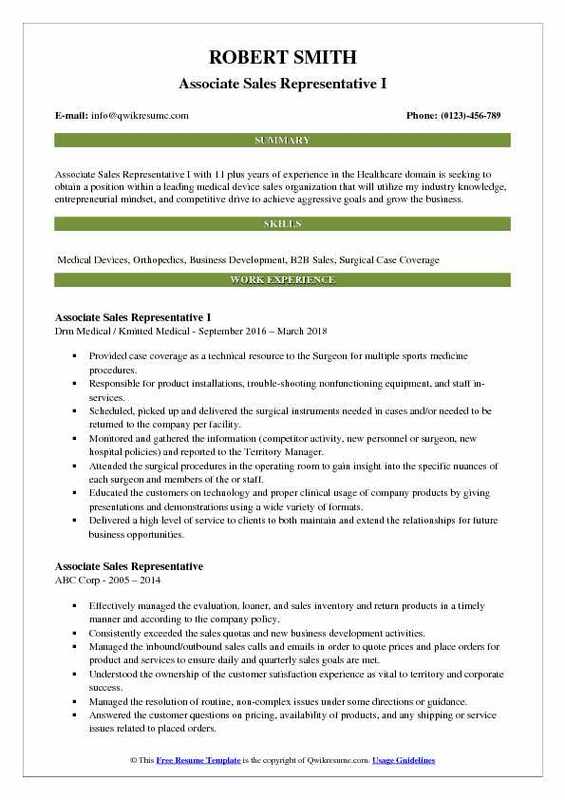 Summary : Associate Sales Representative I with 11 plus years of experience in the Healthcare domain is seeking to obtain a position within a leading medical device sales organization that will utilize my industry knowledge, entrepreneurial mindset, and competitive drive to achieve aggressive goals and grow the business. Provided case coverage as a technical resource to the Surgeon for multiple sports medicine procedures. Responsible for product installations, trouble-shooting nonfunctioning equipment, and staff in-services. Scheduled, picked up and delivered the surgical instruments needed in cases and/or needed to be returned to the company per facility. Monitored and gathered the information (competitor activity, new personnel or surgeon, new hospital policies) and reported to the Territory Manager. Attended the surgical procedures in the operating room to gain insight into the specific nuances of each surgeon and members of the or staff. Educated the customers on technology and proper clinical usage of company products by giving presentations and demonstrations using a wide variety of formats. Objective : Junior Associate Sales Representative with 4 years of experience is seeking to obtain a challenging sales position where utilizing proven sales and organizational skills while enhancing those skills in a mutually rewarding environment. Establishing and maintaining the relationships with the top Podiatrists, Orthopedic and Plastic Surgeons in the Dallas/Fort Worth region. Completed four extensive training programs in regenerative technology, upper and lower extremity reconstruction with a competency level above 90%. Billed over $100,000 in revenue during first six months in the business. Established an instrument management system to manage/track instrument sets within the facility, increasing instrument sales. Conducting highly effective hands-on demonstrations of products encompassing exact step-by-step procedures in Cadaver Labs. Coordinating sales with hospital materials managers and clinical coordinators. Ensuring the superior level of customer service at all times by effectively preparing orders and regularly following-up. Led in-service training sessions for all levels of the clinical and medical staff. Headline : Highly motivated Associate Sales Representative professional with demonstrated ability to exceed performance goals, improve customer satisfaction levels, solve problems and build lasting relationships. Takes pride in work and has qualities that will be useful to your company. Skills : Types 55+wpm, Sales, Marketing, Negotiating, Customer Service, Relationship Building, Customer Satisfaction, Tradeshows, Time Management, Event Planning, Multi-tasking, Problem Solving. Gathering the information from multiple sources and effectively communicate the information to others (within the hospital and other team members). Conducting “in-service” education with hospital stakeholders and clinical staff to raise awareness and collection volume. Recommending solutions for customers and teammates on maximizing their reprocessing program. Leading the business reviews with key customers based on opportunities for growth. Calling on areas of hospitals and surgery centers where additional services can be provided. Improving product knowledge and sales techniques (attended various stryker training programs). Developing and maintaining the relationships with both new and existing customers. Contacted webinar attendees through cold calling and lead generation to obtain future business opportunities. Supervised and answered various customer service issues through the websites "live chat" function. Generated numerous 15-20 page sales proposals based upon RFPs posted by the project management institute. Maintained sales schedules, plan and execute client meetings, and maintain a complex weekly sales report. Negotiated sales prices and payment plans for online and live training classes. Attended networking events, career fairs, professional development conferences, and PMI IIBA meetings to understand both subject matters and generated new sales leads. Provided excellent customer service and follow-through after product implementation. Summary : Associate Sales Representative with 8 years of expertise in interpersonal communication, online marketing, management, sales techniques, office management and market analysis. Resourceful, innovative, detailed-oriented, honest, passionate employee eager to escalate in the corporate world. Building relationships with existing customers in addition to actively performing account reconnaissance on “outlier” accounts in order to target business growth opportunities. Identifying product trends, analyzing case volume, forecasting revenue and growth potential, and analyzing competitive landscape. Analyzing the territory market patterns and prioritize call patterns accordingly. Educating and informing the Surgeons, Nurses, and appropriate Staff Personnel as to the proper use and maintenance of Stryker surgical products. Keeping the sales representative informed on territory progress on a regular basis. Continually performing the account reconnaissance on all accounts to keep a pulse on product volume and trends. Constant education and learning on the job and after hours to make sure product is explained and sold to providers. Providing each customer with the highest level of customer service and satisfaction always. 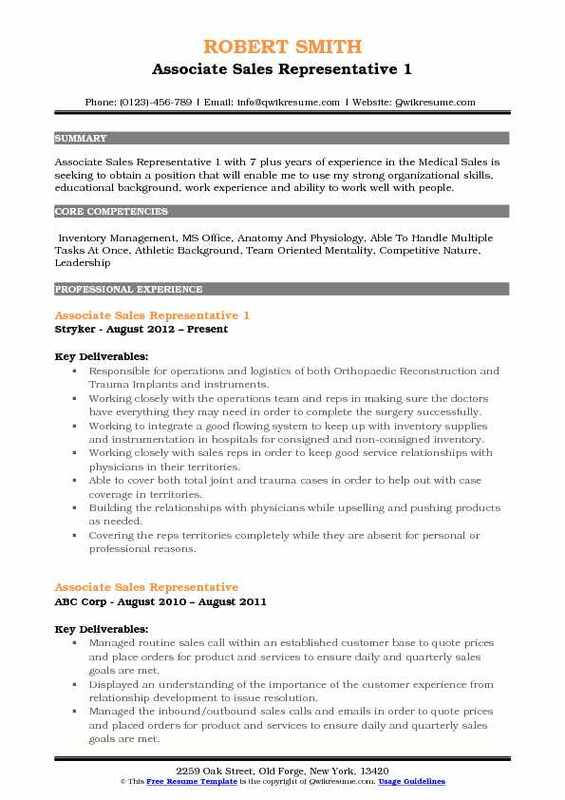 Summary : Associate Sales Representative 1 with 7 plus years of experience in the Medical Sales is seeking to obtain a position that will enable me to use my strong organizational skills, educational background, work experience and ability to work well with people. Responsible for operations and logistics of both Orthopaedic Reconstruction and Trauma Implants and instruments. Working closely with the operations team and reps in making sure the doctors have everything they may need in order to complete the surgery successfully. Working to integrate a good flowing system to keep up with inventory supplies and instrumentation in hospitals for consigned and non-consigned inventory. Working closely with sales reps in order to keep good service relationships with physicians in their territories. Able to cover both total joint and trauma cases in order to help out with case coverage in territories. Building the relationships with physicians while upselling and pushing products as needed. Covering the reps territories completely while they are absent for personal or professional reasons. Performing the sales order processing, promotional request, and sales quotes. Summary : Passionate and hard-working individual who is determined to succeed in sales. 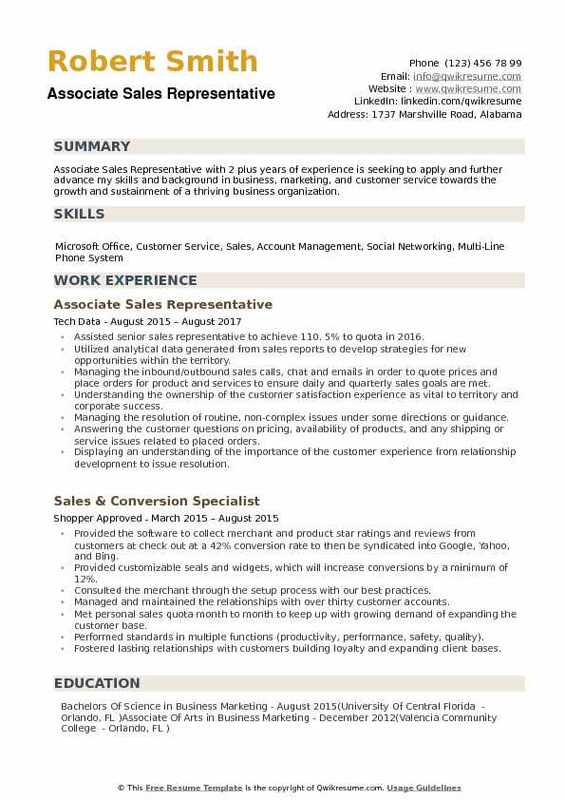 Honest and dedicated quick learner with proven success in sales and customer service. Strong verbal and written communication, organization, multitasking, prioritizing, team building and negotiation skills. 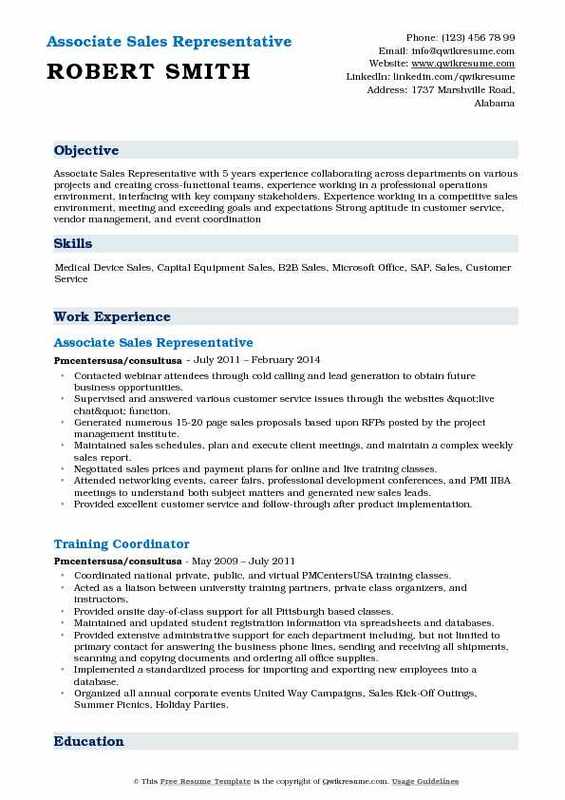 Seeking to start a career at a fast paced organization where my skills will make a positive contribution. Developing the products through in-house research, manufactures, and markets a broad range of surgical devices and instruments for the hospital setting. Key focus on gynecology and endoscopy procedures. Consultative selling and training experience in the operating room setting to surgeons, hospital staff, and administrative personnel to ensure product acceptance and adoption. Extensively engaging in guiding and coaching surgeons on instrument use during surgery. Supporting the sales team within an assigned territory with new equipment installations, equipment troubleshooting and maintenance, demo inventory setup and customer presentations. Experience dealing with management, purchasing and c-level executives for the purchase of capital and increasing product utilization in current accounts to increase monthly disposable. Assisting five full-line representatives in the management and growth of the territory by identifying product champions, launch trials, and selling capital and disposable equipment. Providing or case supporting to surgeons in over 300 cases ensuring successful clinical outcomes. 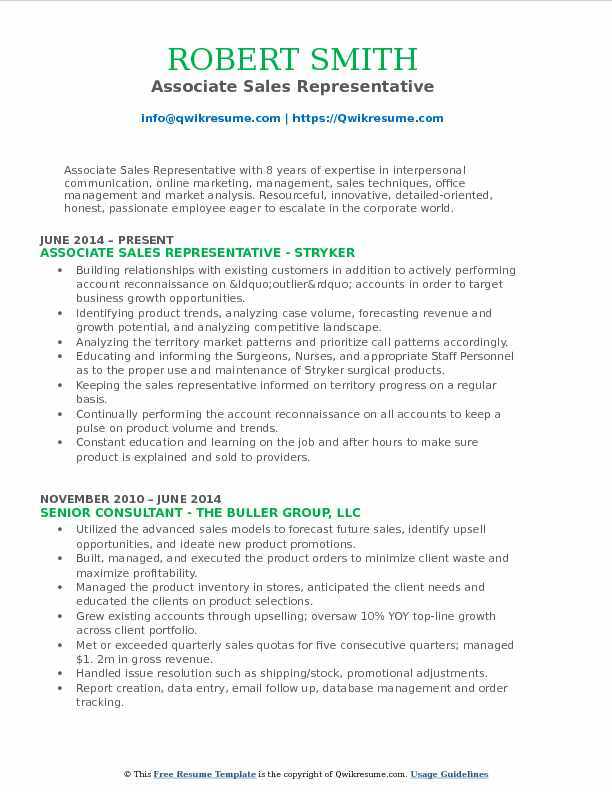 Objective : Associate Sales Representative with 2 plus years of experience is seeking to apply and further advance my skills and background in business, marketing, and customer service towards the growth and sustainment of a thriving business organization. Assisted senior sales representative to achieve 110. 5% to quota in 2016. Utilized analytical data generated from sales reports to develop strategies for new opportunities within the territory. Managing the inbound/outbound sales calls, chat and emails in order to quote prices and place orders for product and services to ensure daily and quarterly sales goals are met. Understanding the ownership of the customer satisfaction experience as vital to territory and corporate success. Managing the resolution of routine, non-complex issues under some directions or guidance. Answering the customer questions on pricing, availability of products, and any shipping or service issues related to placed orders. Displaying an understanding of the importance of the customer experience from relationship development to issue resolution. Representing Tech Data professionally in the daily interface with business partners/customers. Creating quotes for customers based on margins and special pricing agreements.